Few days ago we got little bit of snow...not much...just enough to "paint" the landscape. Maybe it'll survive until Christmas. 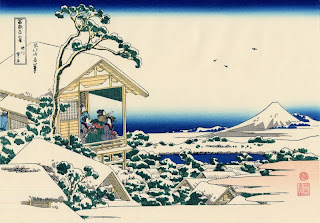 The following print is called "Tea house at Koishikawa The morning after a snowfall". It's made by Hokusai Katsushika (1760-1849). I hope you'll like it.